Disaster strikes! Your pet bird has escaped! But how on earth did your avian friend manage this? When you last left your bird on its own you were sure that you had closed the door. But now your pet bird is sitting smugly on top of your bird cage and you have no idea how this happened? Bird’s and especially parrots can be particularly creative and intelligent when it comes to doors, locks, clips, and latches. With time, they’ll figure out how to open simple locks and even some of the more complex ones that are available. The door only has a simple latch on it. The door can slide and has no lock. The clip that you are using is too weak. You own a parrot or any sort of bird with a strong beak. Luckily, there are a few simple solutions available that when installed will easily prevent any break outs of your birds. Think Your Bird Cage Is Escape Proof? This patented lock in the image above has raving reviews online and has been designed to be escape proof for even the most intelligent of birds, thanks to its special half circle design. However, keep in mind that you’ll need to secure it in place using your own screws. These replacements for King’s Cages listed above can also be secured onto other bird cages to strengthen their locks. Their heavy duty spring will be strong enough to prevent most parrots from being able to pull back and open. 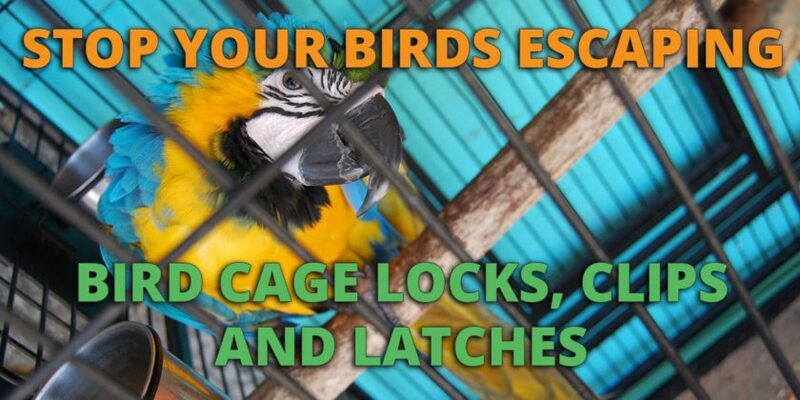 Only use padlocks with a bird cage if you can ensure that a spare set of keys is always available. Otherwise if you lose the key you may have to break into the bird cage to gain access to your bird. The padlocks recommended in the image above have 3 sets of keys per lock. We recommend adding one to your keyring, having another taped to the bottom or side of your cage (in case of emergency) and then the final one placed away in a drawer for safe keeping. You may also need to buy a chain for the padlock to link it through if it cannot fit the cage. The clips available in the image above provide an extra layer of strength and security to existing bird cage doors and are especially difficult for a bird beak to open. Other clips like the ones available here are better suited for hanging toys and food from within the cage.